You’re in for a real treat with some of the cutest baby shower cakes ever! Baby showers are wonderful parties to have. Celebrating new life is always a sign of great things to come, and having a baby shower often brings the parents-to-be hope, happiness, and a lot of useful advice. Not to mention lots and lots of gifts from well-wishers as well! Once you have chosen an amazing theme for your baby shower, then it’s time to pick one of the highlights of the party – the baby shower cake! Of course, you’re going to want an awesome cake for the occasion! Want some great baby shower cake ideas? Looking for design inspiration for what to write on a baby shower cake or how to make a baby shower cake outstanding? Here are 10 Gorgeous Baby Shower Cakes to draw inspiration from if you’re stuck on a theme. Any of these can be modified in the colors of your choice or made gender neutral. They could even become gender reveal cakes too! Whether you’re looking for a baby boy cake or a baby girl cake, extravagant or simple baby shower cakes, you will definitely find plenty of great ideas here! 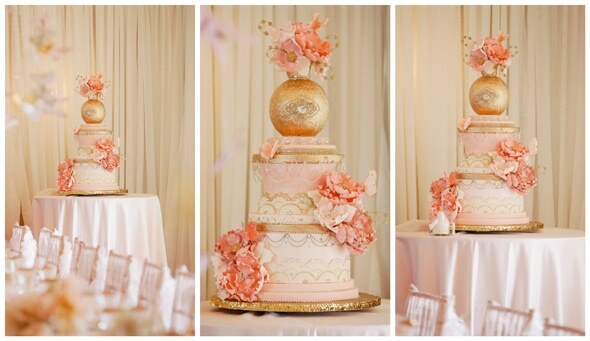 Baby Shower Cake #1: If you’re looking for something chic and elegant, then this pink and gold baby shower cake should be on top of your list of inspirations. Adding some hints of gold to your cake will always bring a touch of elegance, so you can even use other pastel hues if pink is not your thing. Pale yellow and gold, robin’s egg blue and gold – all of these are wonderful color combinations for your elegant baby shower cake! Baby Shower Cake #2: Looking for something subtly rustic? 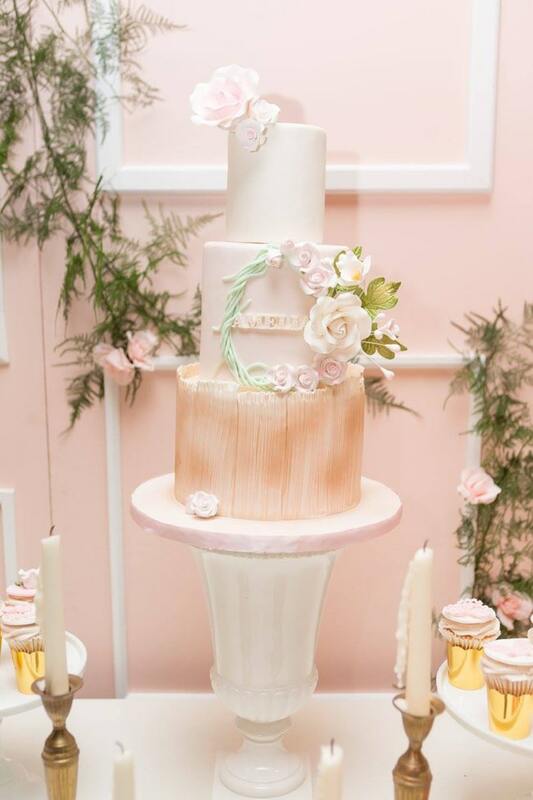 This blush garden baby shower cake is an amazing option. This woodland baby shower cake will be perfect for your nature-themed baby shower with its delicate flower wreath and wood textured accents. It’s truly one of the best unique baby shower cakes around. 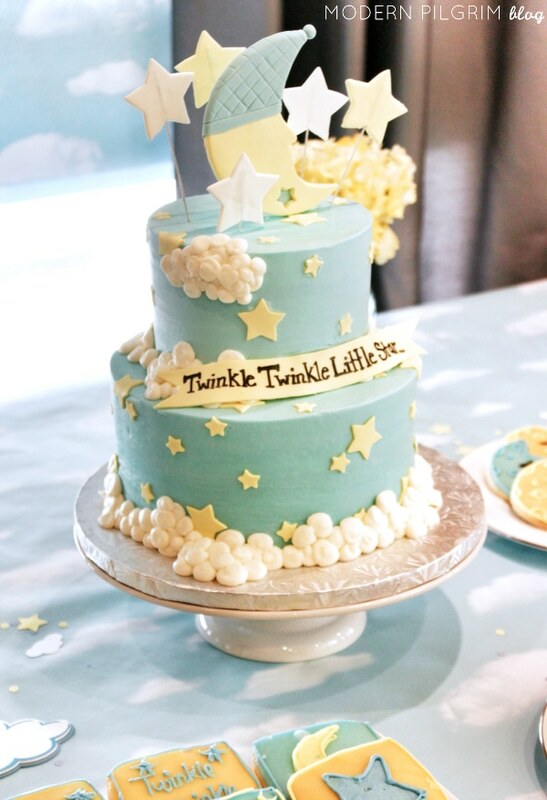 Baby Shower Cake #3: Twinkle Twinkle Little Star is a sweet nursery rhyme that every parent will sing to their child and the stars are just beautiful! This twinkle little star baby shower cake will be a perfect fit for any whimsical baby showers. Having twins? Adding the popular little twin star characters to this cake can turn this into one of the most creative twin baby shower cakes! 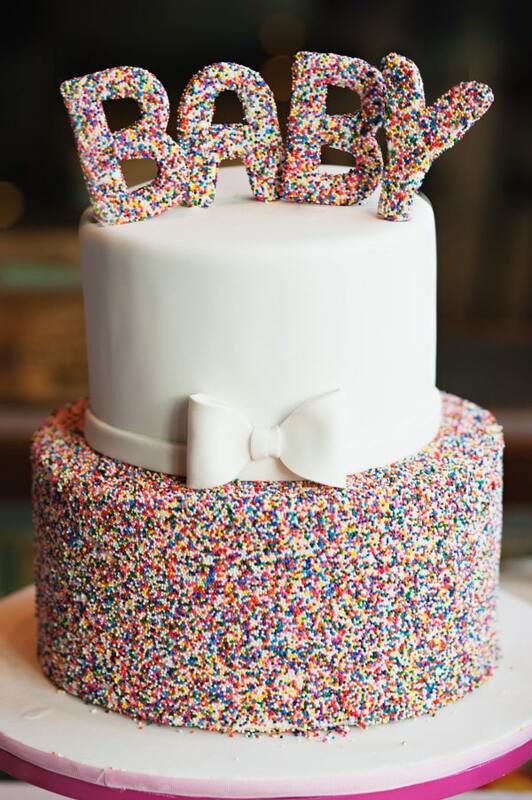 Baby Shower Cake #4: This is one of my absolute favorite cakes – who can say no to sprinkles?! If you want to add a big splash of color to your baby shower, then a baby sprinkle cake is definitely the way to go. This sprinkle baby shower cake is nice and simple to make, but it’s without a doubt eye-catching! If you’re on the hunt for easy baby shower cakes, give this one a go. Baby Shower Cake #5: Can’t go wrong with chevron, rosettes and some sweet fondant teddy bears. The hanging baby blocks, the amazingly formed fondant bow also deserve some applause. 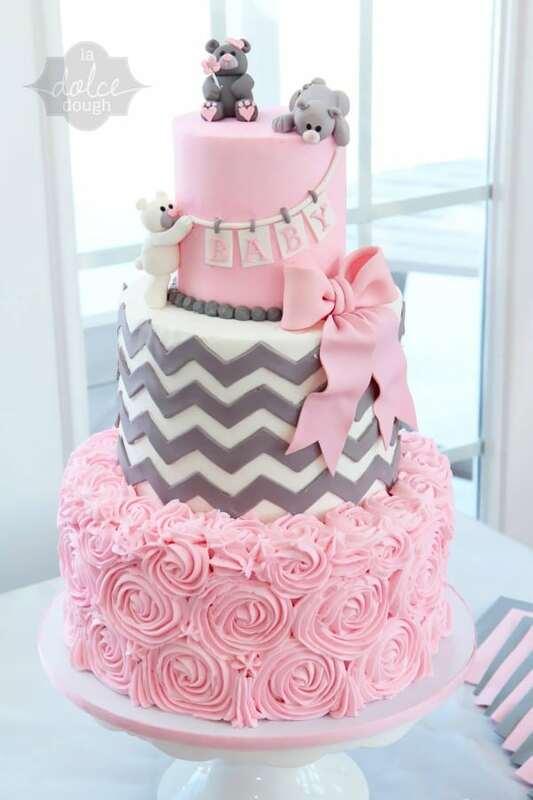 The absolutely gorgeous details on this pink and gray chevron/rosettes teddy bear baby shower cake will make your baby shower one to remember. From the adorable teddy bear cake toppers to the beautifully piped rosettes, this cake is fit for royalty. Baby Shower Cake #6: This is such a sweet gender neutral cake with all those gorgeous pale pink and light blue fondant hearts. 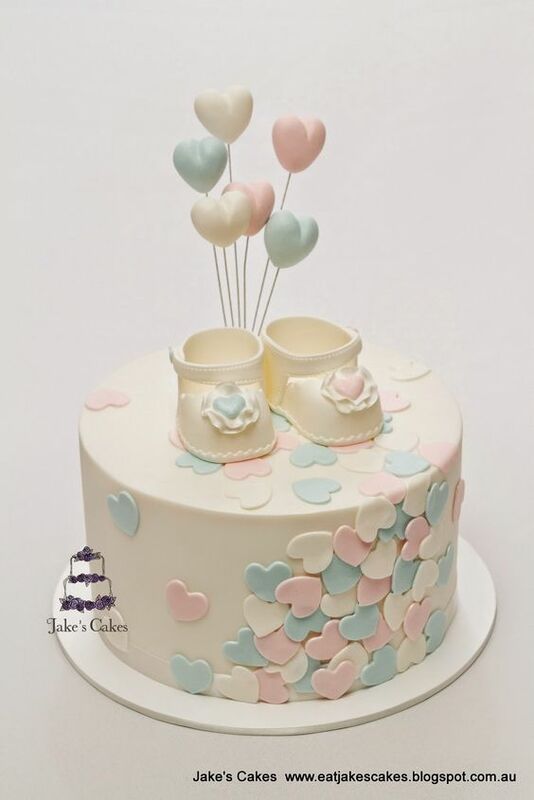 The simple but sweet cake pop hearts on top and cute tiny baby shoes really make this love hearts baby shower cake one of the most delightful baby shower treats. Want to add something to make this simple cake extra special? How about adding cupcakes with little fondant hearts to your dessert selection? You can also use ice cream as the base so your guest will have a pleasant surprise when they take a bite. Baby Shower Cake #7: This is one amazing gender reveal cake for the true, blue Star Wars fan! 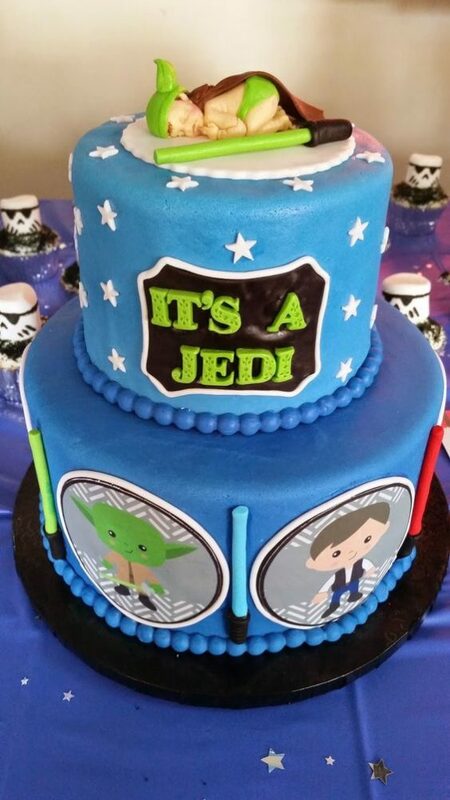 What an awesome Star Wars “It’s a Jedi” baby shower cake! For any solid fan of the popular sci-fi movies, this cute baby shower cake is an absolute must. The cute sleeping baby in a Yoda hat and cloak, the light sabers adorning the cake, and the Yoda, Han Solo, and other Star Wars characters baby shower cake decorations – all these details make this cake out of this world and definitely from a galaxy far, far, away! Baby Shower Cake #8: The colors here just work together swimmingly – and how sweet are those bow ties?! 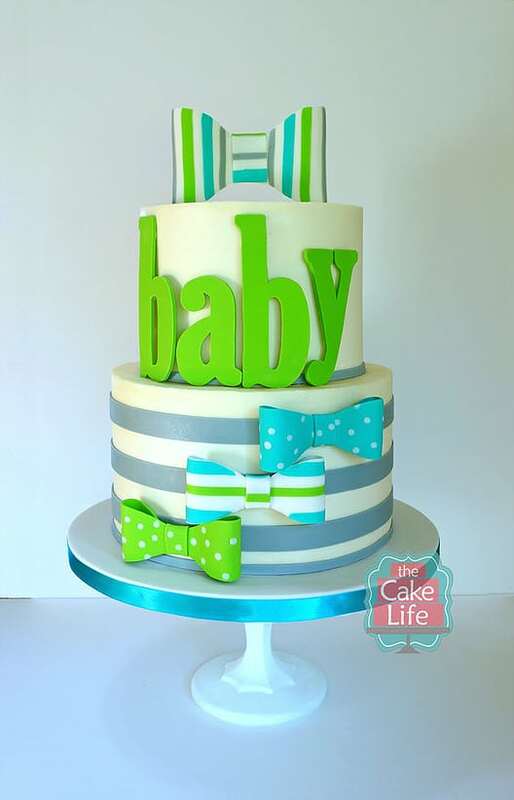 This green/blue bow tie baby shower cake can be a good gender-neutral cake, and the modern design of the cake can also fit any color scheme. So whether you’re looking for baby shower cakes for boys or baby shower cakes for girls, you really can’t go wrong with this design. 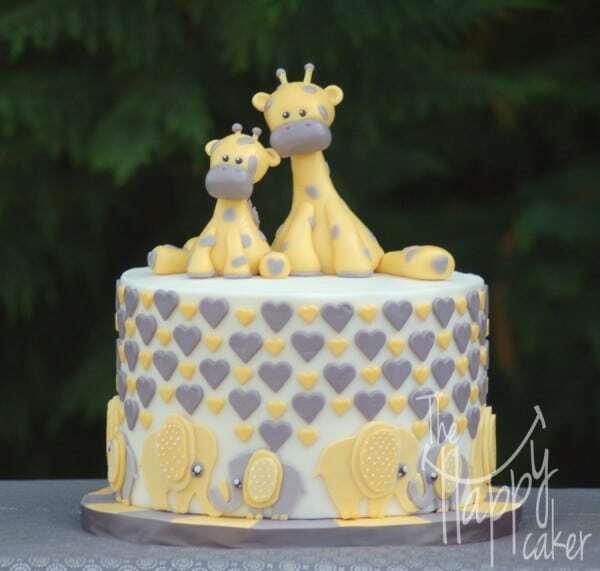 Baby Shower Cake #9: Is this not such a sweet cake with giraffes, elephants and hearts!? An amazing addition to any safari-themed baby shower is this giraffe and elephant baby shower cake. Pale yellow and light gray is a great color mixture for this sweet cake, but feel free to modify the colors to suit the theme of your baby shower. Want different animals? Why not! You can make a pig and duck cake or a dog and cat cake. What makes this cake so great is that you can be super creative with customizing this cake design for any baby shower. Baby Shower Cake #10: Buttons and sweet little baby outfits hanging on a line – absolutely adorable! But what makes this cake a true standout is the big teddy bear cake topper adorning it! Beautifully crafted with amazing detail (just look at those individual buttons! ), this blue buttons baby shower cake is perfect for any little prince. Use baby pink instead if you want a princess baby shower cake or even pale yellow or green for a gender neutral cake. This beautiful cake would be perfect to celebrate any new baby! I love looking for new ideas for all kinds of cakes to help you plan your parties. After all, you can’t really call your party complete if you don’t have a wonderful cake to serve as the centerpiece of your table, right? One of the best ways to make your party fabulous is with an incredible cake! I hope the next shower you plan will draw inspiration from one of these 10 Gorgeous Baby Shower Cakes! Which one is your favorite? Do you want other ideas like baby shower sheet cakes or maybe a cute onesie cake? Let us know in the comments below!